Embark on a short but delicious break in luscious Lima. Learn local cooking secrets, discover exotic fruits, listen to the spruiking of fishmongers in the markets and learn all about the popular spirit, pisco. Jam-packed with culinary delights and culture, this snappy tour is the perfect way to experience Peru’s charismatic capital in all its gastronomic glory. Bienvenidos! Welcome to Lima. Meet your guide in the foyer of your hotel 3.30pm. Please note that you will need to bring your passport and Andean Immigration Card to this meeting, so that your guide can make a copy to comply with Peruvian tax regulations. If you have any issues with the pick-up on Day 1 of this trip, please call the Intrepid office on + (51) 99605 5559. 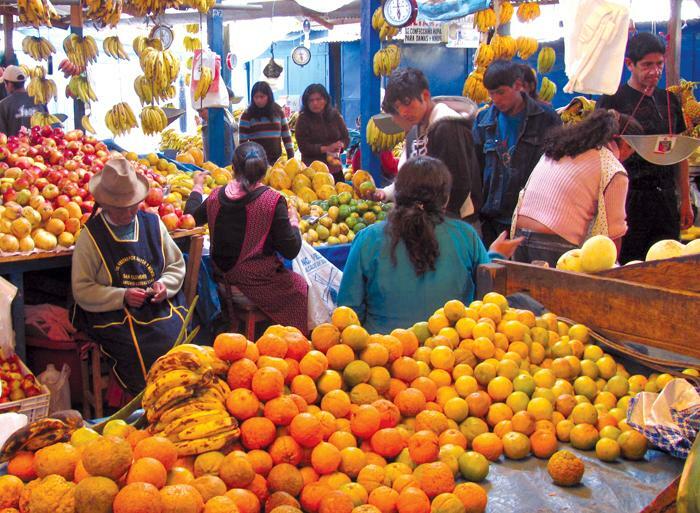 Kick off this Bite-size Break with a tour of Surquillo market to discover the building blocks of Peruvian cuisine. Explore a huge variety of fruits, vegetables, and fiery spices, and maybe make a purchase or two. From aji limo to aji mirasol and aji panca to cumin, plus the wonderful fresh limes, chirimoya, and lucuma fruits, this place really is a feast for your senses. Next, take a city bus to a local family home in the residential neighbourhood of Chorrillos (south of Barranco and Miraflores). Here, the star is Doña Mechita, a caring Peruvian mother and the best cook in her family. She’ll share family recipes that have been passed down through generations. Learn to prepare a classic ceviche, Peru’s national dish, from fresh fish and a delicious mix of limes, onions, coriander, and a few other secret ingredients. You’ll also try a surprising chicha morada. Never heard of it? This purple corn drink is typical of Lima, and the corn is believed to have healing properties. And to round it all out, learn to prepare the perfect pisco sour. Feast on your creations for dinner. Return to your hotel or continue to explore - your guide will have plenty of suggestions for evening activities. Head out of the city to southern Lima, your first stop is at the archeological site of Pachamac, an important pre-Incan administrative centre. Then visit a pisco distillery. A brandy distilled from wine grapes, pisco is considered the national drink of Peru. Originally developed by Spanish settlers in the 16th century, it is widely believed to have originated from the Peruvian town of Pisco - although its Peruvian origins are hotly contested by nearby Chile, who is also a major producer of the spirit. Go on a grape to glass discovery of what makes the perfect pisco from a passionate local pisco maker. In the early evening, join a walking tour through the bustling, beachside district of Barranco, where streets are lined with traditional casonas (colonial-style houses). Your tour will conclude at approximately 8.00pm in Barranco. Grab a bite to eat in a buzzing restaurant alongside the locals or return to Miraflores. There are no activities planned for Day 3 and you are free to leave at any time.